Patch Notes (v1.0.9) Welcome to Science! We've been watching how much you're now enjoying the Bandit King, Elites, and, of course, that elusive Gold Ore Node- you're all smashing it outta the park! Now, we hinted (heavily!) about Science coming and now its beginning to reveal itself! This is the beginning of Science. You've spent the last week preparing and wondering, all trying to get your hands on those precious Gold Ore Nodes to get Gold blocks. And now is when you find out what you need them for! /is level 19 - That's right a brand new island level. What do you need to get /is level 19? What unlocks when you upgrade to /is level 19? There will be more new levels after this one, and you're gonna need to get more Science blocks - so keep on grinding those out because who knows what Science will bring with each new /is level? Science is bringing new and exciting ways to automate - Auto Crafters being the offering that goes hand in hand with /is level 19. You have access to three recipes: Poisonous Potatoes, Corrupt Chorus Fruit and Diamonds. The Crafter will search for items to craft Poisonous Potatoes first, then Corrupt Chorus Fruit and finally if neither of the first two, Diamonds. 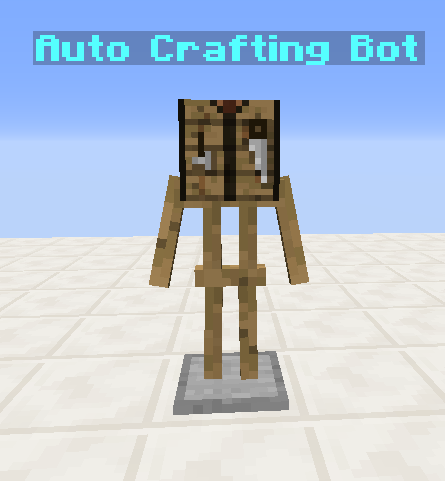 Once crafted, the Auto Crafters will eject the items out at their feet - similar to that of the Auto-Miners. When you open up the inventory for the crafting bot, there is a countdown showing when the next item will be crafted. Similar to Auto Miners, these have settings to improve a number of areas which will increase the efficiency of the crafter. The Plague Doctor heard the call of arms from the Bandit King and has joined the fight to protect the Lost Wastelands! Just like with the Bandit King, this boss has its own set of abilities, as well as its own boss set. 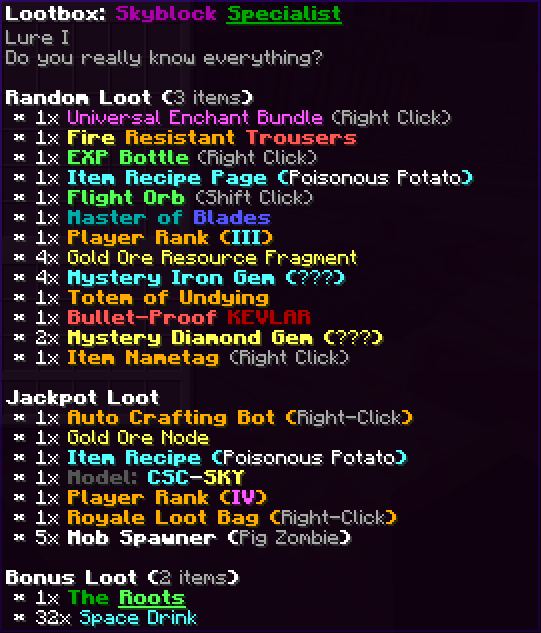 You can obtain that all, plus other awesome loot, as a chance when it's defeated! In the same way as the Bandit King, the Plague Doctor spawns every 4 hours - unless enough Elite Undeads are killed to trigger it to be spawned as a chance that way. A notification will come up in chat and announce where it will spawn and at which co-ordinates! 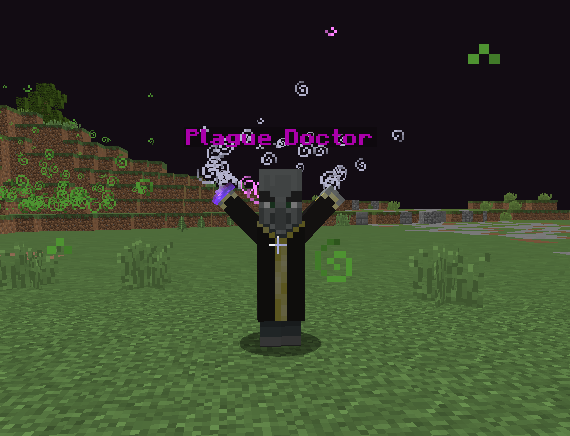 The Plague Doctor is a custom coded boss, with some AMAZING abilities. It also has some fantastic loot, including its own armor set (with a new Boss Tier Enchant)! Along with this new boss, we have another new enchant which you're all going to want! Of course, as with Bleed - this is a boss only enchant, and you'll only be able to obtain it by killing the Plague Doctor and grabbing yourself a piece of gear with it on! We're over 50 days into CosmicSky, and if you're not a specialist by now - where have you been? This weeks lootbox is, as always, jam-packed full of goodies. We're constantly looking for ways to improve gameplay for you, and have been listening to your suggestions. Flight Orbs, even though they've had adjustments to make them more user-friendly, were still a sticking point for a lot of people. So, not only do you need an empty hand to activate them, but you also need to SHIFT whilst doing so. This should hopefully alleviate those issues where people would be building whilst flying and run out of the stack, or just when they misclick. As always we're keeping an eye on the new updates to make sure they're balanced. This week we've kept a close eye on the Elite Undeads in Lost Wasteland. They were acting a little bit too big for their boots! We couldn't be happier with everyone's progress and the diversity we are seeing on everyone's islands- You're all killing it! To celebrate everyone being awesome, we're giving you all a 30% OFF Sale over everything on the server store- so don't delay, it's only about for the weekend! Don’t forget to use code Whiskey at checkout! You mean code char right? Or any of the other content creators codes! So I’m assuming that yoh need island level 18 first correct? And how do you get auto crafters other than the loot box? 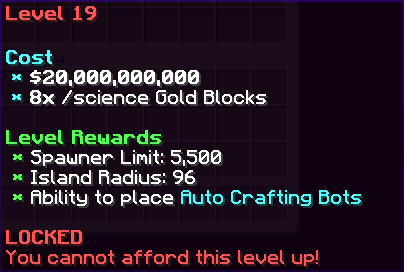 20billion for the upgrade is asinine, especially when all you get for it is auto crafters which, for quality of life alone, shouldn’t be locked behind a paywall to begin with. Pretty unhappy with this update.